You will not believe how FLAVORFUL and delicious this Chicken Fajita Soup is! It has all the delicious flavors of Chicken Fajitas, like tender chicken, sweet bell peppers and onions, and zesty fajita seasoning, all enveloped in a thick and flavor packed broth. This soup is warm and filling and can be made into an appetizer or is perfect as a satisfying meal. 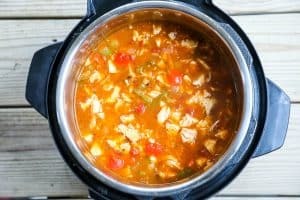 This Chicken Fajita Soup recipe is so rich and delicious, you would never guess it is also gluten free, dairy free, paleo, and Whole30 compliant (when served with compliant toppings)! To top it all off, since it is made in the Instant Pot, it is quick and easy to make and clean up. One of the details that makes this soup recipe so special is that it is intensely flavorful due to it’s thicker broth, but is still super light and healthy to eat. I knew exactly what I was going for when I started creating this soup, as there was a similar soup I used to get when we were stationed in Las Vegas. The problem with many Chicken Fajita Soup recipes, is that the broth is far too thin and watery, so it makes me want to add a lot of less healthy stuff into the soup to get a more substantial texture. It took 7 times experimenting and re-making this recipe, but I FINALLY got just the soup I remembered from our time in Las Vegas. It is still a broth based soup, but the broth is thick, hearty and rich with flavor. This soup recipe is pure perfection! The military has taken us all over the world and in each place I have made incredible friends, and with each move we leave those friends and family behind, but just as I love to stay connected by recreating the flavors I would enjoy with my friends in each location, I am so thankful that it has become so much easier to stay connected over the phone and internet. The T-Mobile ONE Military plan has made it possible for us personally to stay connected like never before with the amazingly affordable rates and virtually unlimited data. In-flight texting +1 hour of data on all Gogo®-enabled flights, to, from or within the US. T-Mobile also always has special promotions, so if you have been eyeing that new iPhone, you can get up to $390 off an Apple iPhone XR, XS or XS Max, or up to $360 off an Apple iPhone X, 8 or 8 Plus (via monthly bill credits). This is just one of the ways they make it easy to switch, so check the current deals and see if a shiny new phone might be in your future! And to top it all off, no one is faster or has more LTE availability than T-Mobile. So no matter where you get stationed, or the military sends you, T-Mobile will have you covered! You can check the coverage map here! So now as soon as I got this soup recipe right, I could start texting it and sharing it with my friends and family all over the country, who immediately demanded I blog it, so they could share it with their friends too. CEO and Chef, John Legere. 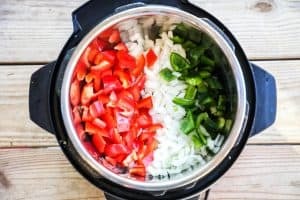 You should check this out if you enjoy slow cooker recipes as much as I do. I really hope you love this soup just as much as we have! *Denotes toppings that are generally gluten-free, paleo, and whole30 compliant. You can pick one topping, a few, or really load it up depending on your what you are in the mood for and how much time you have for prep. Let me know in the comments if you have an other toppings you love that I missed! 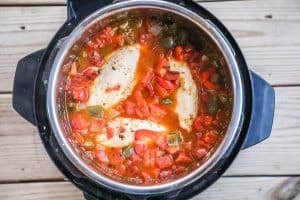 This Chicken Fajita Soup is made super simple by using your Instant Pot or electric pressure cooker. With everything made together in just one pot, there is very little prep and clean up! To start, add the onions, bell peppers, and oil to the pot and use sauté mode to cook until the onions start to turn translucent, or about 5 minutes. You will want to stir regularly while cooking to avoid any of the veggies sticking to the bottom of the pot which can cause the pot to have trouble pressurizing. Once the vegetables are soft, turn off the pot and then add the chicken broth, tomatoes, green chiles, salsa and seasoning and mix well. It is important that you get everything combined well so that nothing will stick to the bottom of the pot and cause trouble with pressurizing your pot. Once mixed, lay the chicken breast on top of the soup and press them into the mixture so they are just covered with liquid. Place the top on the Instant Pot and then set to cook on High Pressure for 6 minutes. Cooking time may vary because of the thickness of your chicken breast, as well as, the altitude you live at. If you have thicker chicken breasts, you can slice them, or increase the cooking time. You may also need to increase the cooking time for higher altitudes. Quick release the pressure, meaning when the timer goes off, immediately release the pressure from the Instant Pot. 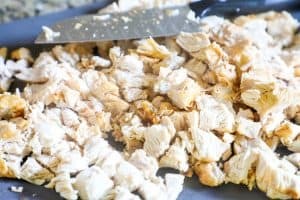 Once the pot has depressurized, remove the lid and use a fork to carefully remove the chicken breast from the cooker and onto a cutting board. The chicken will be very hot, so make sure to do this step very carefully. Dice the chicken into small bite sized pieces and then mix it carefully back into the soup. You can serve the soup immediately with your choice of toppings! Soup can be reheated on the stove top, or in the microwave. I like to store the soup in meal sized containers to make it easy to reheat leftovers. Do you have any more soup recipes this easy and delicious?! 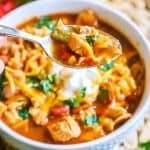 I hope that you get a chance to make this delicious Chicken Fajita Soup for your friends and family soon! 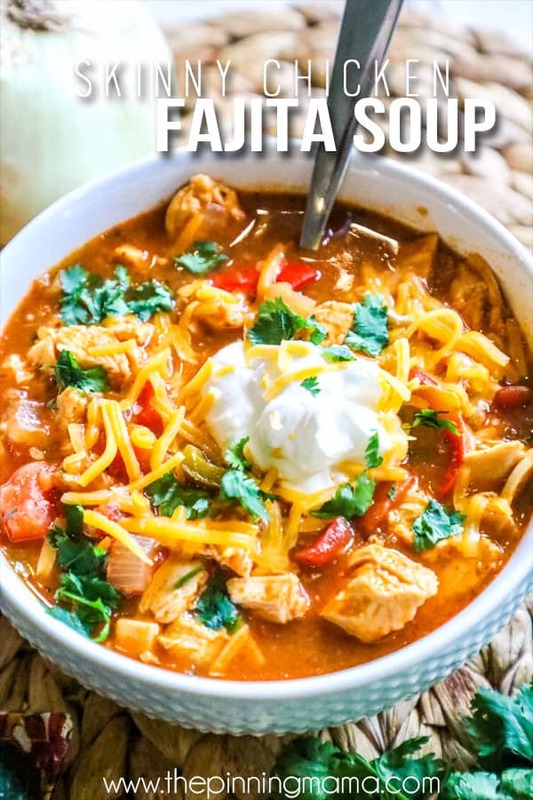 This Chicken Fajita Soup is a triple threat! It is absolutely LOADED with flavor, so easy to make, and healthy to boot! Chop the onion finely and dice the bell pepper coarsely. Add the peppers, onions, pressed garlic and oil to the pressure cooker pot and turn to Sautè mode. Cook until the onions start to become translucent and fragrant or about 5 minutes, stirring frequently, then turn the pot off. Add fajita seasoning, broth, salsa, tomato paste, tomatoes, and green chiles to the pot and mix well. Once it is done cooking, quick release the pressure. Remove the lid and carefully remove the chicken breasts, chop them into small bite-sized pieces and then stir the chicken back into the soup. Serve warm with your choice of toppings! Enjoy! Cook time will vary based on thickness of chicken breasts and altitude. I use 6 minutes with average sized chicken breasts, located at sea level. Leftovers can be stored in the refrigerator for 3-4 days or in the freezer for up to a month. Chicken thighs, tenderloins, or other boneless, skinless chicken cuts can be substituted for chicken breast, although cooking time may change. This recipe is naturally gluten free, paleo, and whole30 compliant. Topping suggestions may not be compliant. Please check all packages of products bought to ensure they meet desired guidelines. 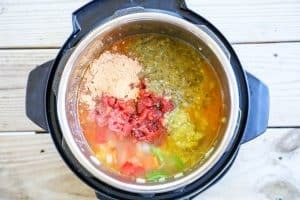 Don’t have the instant pot, can it be prepared in a crockpot? Yes you should be able to prepare it in a crockpot or on the stove top as well. I don’t have full recipes written for that at this time though. I hope you enjoy the soup! Don’t have an instant pot. Can I use a crockpot ?